Instead of having my Friday contest, I am giving everyone a pattern today! "County Christmas Doily" is my updated version of a classic doily pattern. The cheerful colors remind me of gingham fabric and Christmas at my Grandmama's house when I was a little girl. I hope you will enjoy it! Rnd 4: Working behind petals, ch 4, (sl st between next 2 petals, ch 4) around, join with sl st in first ch of beg ch-4. Rnd 5: Sl st into first ch-4 sp, ch 1, (sc, ch 1, 4 dc, ch 1, sc) in first ch-4 sp and in each ch-4 sp around, join with sl st in first sc. Rnd 6: Working behind petals, ch 5, (sl st between next 2 petals, ch 5) around, join with sl st in first ch of beg ch-5. Rnd 7: Sl st into first ch-5 sp, ch 1, (sc, ch 1, 6 dc, ch 1, sc) in first ch-5 sp and in each ch-5 sp around, join with sl st in first sc. Rnd 8: Working behind petals, ch 6, (sl st between next 2 petals, ch 6) around, join with sl st in first ch of beg ch-6. Rnd 9: Sl st into first ch-6 sp, ch 1, (sc, ch 1, 8 dc, ch 1, sc) in first ch-6 sp and in each ch-6 sp around, join with sl st in first sc. Rnd 10: Working behind petals, ch 7, (sl st between next 2 petals, ch 7) around, join with sl st in first ch of beg ch-7. Rnd 11: Sl st into first ch-7 sp, ch 1, (sc, ch 1, 10 dc, ch 1, sc) in first ch-7 sp and in each ch-7 sp around, join with sl st in first sc. Rnd 12: Working behind petals, ch 8, (sl st between next 2 petals, ch 8) around, join with sl st in first ch of beg ch-8. Rnd 13: Sl st into first ch-8 sp, ch 1, (sc, ch 1, 12 dc, ch 1, sc) in first ch-8 sp and in each ch-8 sp around, join with sl st in first sc. Rnd 14: Working behind petals, ch 9, (sl st between next 2 petals, ch 9) around, join with sl st in first ch of beg ch-9. Rnd 15: Sl st into first ch-9 sp, ch 1, (sc, ch 1, 14 dc, ch 1, sc) in first ch-9 sp and in each ch-9 sp around, join with sl st in first sc. Rnd 16: Working behind petals, ch 10, (sl st between next 2 petals, ch 10) around, join with sl st in first ch of beg ch-10. Rnd 17: Sl st into first ch-10 sp, ch 1, (sc, ch 1, 3 dc, 10 tr, 3 dc, ch 1, sc) in first ch-10 sp and in each ch-10 sp around, join with sl st in first sc. Fasten off. C: sc in same place as joining sc, ch 10, sc in 2nd ch from hook, hdc in each of next 2 chs, dc in each of last 6 chs, sc in same place as joining. (third Leaf made) Fasten off. For Second group of Leaves, join green with sc between 3rd and 4th petals, repeat Steps A-C.
For Third group of Leaves, join green with sc between 5th and 6th petals, repeat Steps A-C.
For Fourth group of Leaves, join green with sc between 7th and 8th petals, repeat Steps A-C.
Rnd 19: Join cream with sc in tip of center Leaf on first group of Leaves, ch 6, sc in tip of next Leaf, ch 6, dc in 3rd tr of next petal, ch 6, skip next 4 tr, dc in next tr, ch 6, dc in 3rd tr of next petal, ch 6, skip next 4 tr, dc in next tr, ch 6, *(sc in tip of next Leaf, ch 6) 3 times, dc in 3rd tr of next petal, ch 6, skip next 4 tr, dc in next tr, ch 6, dc in 3rd tr of next petal, ch 6, skip next 4 tr, dc in next tr, ch 6; repeat from * 2 more times, sc in tip of next Leaf, ch 6, join with sl st in first sc. Rnd 20: Ch 1, sc in first sc, 5 sc in each ch-6 sp with sc in each dc and in each sc around, join with sl st in first sc. Rnd 21: (Ch 10, dc) in first st, ch 1, skip next sc, (dc in next sc, ch 1, skip next sc) 20 times, *(dc, ch 7, dc) in next sc, ch 1, skip next sc, (dc in next sc, ch 1, skip next sc) 20 times; repeat from * around, join with sl st in 3rd ch of ch-10. Fasten off. Rnd 22: Join red with sl st in first ch sp, ch 5 (counts as first tr and ch-1), (tr, ch 1) 7 times in same sp as joining, skip next ch-1 sp, (3 dc in next ch-1 sp, ch 1, skip next ch-1 sp) 10 times, *(tr, ch 1) 8 times in next ch-7 sp, skip next ch-1 sp, (3 dc in next ch-1 sp, ch 1, skip next ch-1 sp) 10 times; repeat from * around, join with sl st in 4th ch of ch-5. Fasten off. Notes: In each of Rnds 23-31, the first 4 chs of the ch at the beginning of the round will count as the first tr. At the end of each round, you will join with a sl st in the 4th ch of the starting chain and fasten off; you will also join in this same ch to start the following round. Rnd 23: Join cream with sl st in 4th ch of ch-5 on pr (previous rnd; see Special Abbreviation), (ch 5, tr, ch 1) in same ch as joining, (tr, ch 1, tr, ch 1) in each of next 7 tr, skip next ch-1 sp, skip next 3 dc, (3 dc in next ch-1 sp, ch 1, skip next 3 dc) 9 times, *(tr, ch 1, tr, ch 1) in each of next 8 tr, skip next ch-1 sp, skip next 3 dc, (3 dc in next ch-1 sp, ch 1, skip next 3 dc) 9 times; repeat from * around, join with sl st in 4th ch of ch-5. Fasten off. Rnd 24: Join red with sl st in 4th ch of ch-5 on pr, ch 6 (counts as first tr and ch-2), tr in next tr, (ch 2, tr in next tr) 14 times, ch 1, skip next ch-1 sp, skip next 3 dc, (3 dc in next ch-1 sp, ch 1, skip next 3 dc) 8 times, *tr in next tr, (ch 2, tr in next tr) 15 times, ch 1, skip next ch-1 sp, skip next 3 dc, (3 dc in next ch-1 sp, ch 1, skip next 3 dc) 8 times; repeat from * around, join with sl st in 4th ch of ch-6. Fasten off. Rnd 25: Join cream with sl st in 4th ch of ch-6 on pr, ch 7 (counts as first tr and ch-3), tr in next tr, (ch 3, tr in next tr) 14 times, ch 1, skip next ch-1 sp, skip next 3 dc, (3 dc in next ch-1 sp, ch 1, skip next 3 dc) 7 times, *tr in next tr, (ch 3, tr in next tr) 15 times, ch 1, skip next ch-1 sp, skip next 3 dc, (3 dc in next ch-1 sp, ch 1, skip next 3 dc) 7 times; repeat from * around, join with sl st in 4th ch of ch-7. Fasten off. Rnd 26: Join red with sl st in 4th ch of ch-7 on pr, ch 8 (counts as first tr and ch-4), tr in next tr, (ch 4, tr in next tr) 14 times, ch 1, skip next ch-1 sp, skip next 3 dc, (3 dc in next ch-1 sp, ch 1, skip next 3 dc) 6 times, *tr in next tr, (ch 4, tr in next tr) 15 times, ch 1, skip next ch-1 sp, skip next 3 dc, (3 dc in next ch-1 sp, ch 1, skip next 3 dc) 6 times; repeat from * around, join with sl st in 4th ch of ch-8. Fasten off. Rnd 27: Join cream with sl st in 4th ch of ch-8 on pr, ch 9 (counts as first tr and ch-5), tr in next tr, (ch 5, tr in next tr) 14 times, ch 1, skip next ch-1 sp, skip next 3 dc, (3 dc in next ch-1 sp, ch 1, skip next 3 dc) 5 times, *tr in next tr, (ch 5, tr in next tr) 15 times, ch 1, skip next ch-1 sp, skip next 3 dc, (3 dc in next ch-1 sp, ch 1, skip next 3 dc) 5 times; repeat from * around, join with sl st in 4th ch of ch-9. Fasten off. Rnd 28: Join red with sl st in 4th ch of ch-9 on pr, ch 10 (counts as first tr and ch-6), tr in next tr, (ch 6, tr in next tr) 14 times, ch 1, skip next ch-1 sp, skip next 3 dc, (3 dc in next ch-1 sp, ch 1, skip next 3 dc) 4 times, *tr in next tr, (ch 6, tr in next tr) 15 times, ch 1, skip next ch-1 sp, skip next 3 dc, (3 dc in next ch-1 sp, ch 1, skip next 3 dc) 4 times; repeat from * around, join with sl st in 4th ch of ch-10. Fasten off. Rnd 29: Join cream with sl st in 4th ch of ch-10 on pr, ch 11 (counts as first tr and ch-7), tr in next tr, (ch 7, tr in next tr) 14 times, ch 1, skip next ch-1 sp, skip next 3 dc, (3 dc in next ch-1 sp, ch 1, skip next 3 dc) 3 times, *tr in next tr, (ch 7, tr in next tr) 15 times, ch 1, skip next ch-1 sp, skip next 3 dc, (3 dc in next ch-1 sp, ch 1, skip next 3 dc) 3 times; repeat from * around, join with sl st in 4th ch of ch-11. Fasten off. Rnd 30: Join red with sl st in 4th ch of ch-11 on pr, ch 12 (counts as first tr and ch-8), tr in next tr, (ch 8, tr in next tr) 14 times, ch 1, skip next ch-1 sp, skip next 3 dc, (3 dc in next ch-1 sp, ch 1, skip next 3 dc) 2 times, *tr in next tr, (ch 8, tr in next tr) 15 times, ch 1, skip next ch-1 sp, skip next 3 dc, (3 dc in next ch-1 sp, ch 1, skip next 3 dc) 2 times; repeat from * around, join with sl st in 4th ch of ch-12. Fasten off. Rnd 31: Join cream with sl st in 4th ch of ch-12 on pr, ch 13 (counts as first tr and ch-9), tr in next tr, (ch 9, tr in next tr) 14 times, ch 1, skip next ch-1 sp, skip next 3 dc, 3 dc in next ch-1 sp, ch 1, skip next 3 dc, *tr in next tr, (ch 9, tr in next tr) 15 times, ch 1, skip next ch-1 sp, skip next 3 dc, 3 dc in next ch-1 sp, ch 1, skip next 3 dc, skip next ch-1 sp; repeat from * around, join with sl st in 4th ch of ch-6. Fasten off. Rnd 32: Join red with sc in center dc of any 3-dc group, ch 4, sc in next tr, ch 4, picot (see Special Stitches) in next ch-9 sp, ch 4, (picot in next tr, ch 4, picot in next ch-9 sp, ch 4) 14 times, sc in next tr, ch 4, *sc in center dc of next 3-dc group, ch 4, sc in next tr, ch 4, picot in next ch-9 sp, ch 4, (picot in next tr, ch 4, picot in next ch-9 sp, ch 4) 14 times, sc in next tr, ch 4; repeat from * around, join with sl st in first sc. Fasten off. Special thanks go to Jolene Ortiz and Jewel Fernly for testing this pattern. Sorry about all those ends, Jolene! This pattern is a variation on a vintage pattern that is now in the public domain. This pattern and photographs copyright BellaCrochet 2014. All rights reserved. Please do not distribute or post this pattern on any website, group or page; please share the Link to this page only. Absolutely Beautiful. Thank you for sharing! That is Stunning! Thank you! Beautiful!!! Thank you very much!!!! Thank you for sharing, This is beautiful and I can't wait to get started on this pattern. Wow...words fail. Your doily is a work of art. Thanks so much for sharing the pattern with us. So beautiful. Thanks for sharing. I'm going to give this a go but in my 'Christmas' colors - blue and silver. Thank you, this is so beautiful!! Oh, I just adore this! Definitely on my projects list. Thanks for the pattern!! This is lovely. I've been looking for just the "right" Christmas doily, and this is it. Thank you for sharing the pattern. 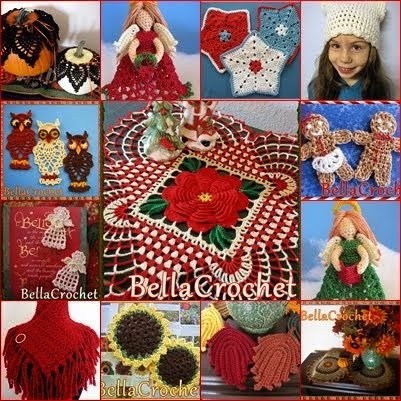 Thank you so much for the pattern I love to crochet these type of doilies. I am so pleased with this pattern. I used Red Heart crochet thread, size 10 thread. I used burgundy art.144 in place of the red and a mauve in place of the cream. The green I used was a paler yellow green. This was a beautiful color combination with a Victorian style to be used year round. Thank you for sharing this pattern. You can highlight the pattern and copy and paste to Notepad or in a Word Document, Mollyb, and then print it from that. I believe you should also be able to right click on the pattern, and print it. Beautiful pattern! Thank you for sharing this! I started on it last night and I'm loving how beautiful it is turning out, not to mention that your directions are very easy to follow. Again, thank you and God bless you! This is absolutely stunning! I will have to gather up my thread and start it this weekend. Thank you, thank you, thank you. This is the most beautiful doily I have ever seen. Words are not adequate to express how much I love this. Thank you so much for the pattern and for designing this lovely piece. WOW! Your patterns are gorgeous! I plan to use several as gifts. Thank you!! Thankyou. I love this doilie..and the pattern is well written. I can't wait to make one in different colors for her birthday and the red and white for myself for Christmas. I have made something similar to this thirty+ years ago. My mom had made one in her teens, I took it and duplicated the stitching. If pics can be posted here I'll try to. The original had disappeared before she passed away, I hope that she had given it to another family member who will take care of it.